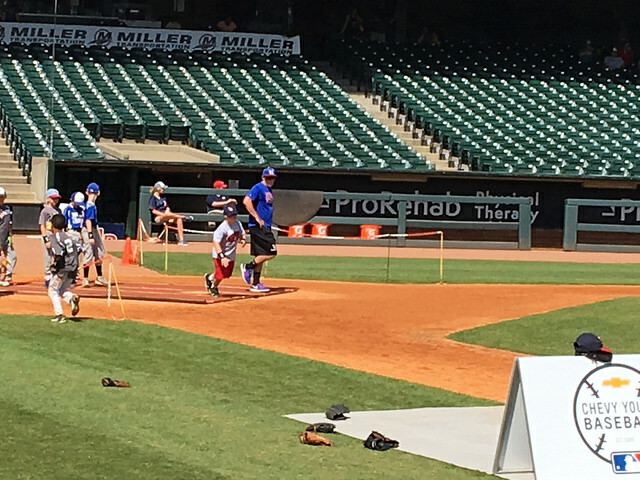 Louisville Slugger Field-Louisville, KY: Last weekend the Bats hosted a youth camp sponsored by the local Chevy dealerships. 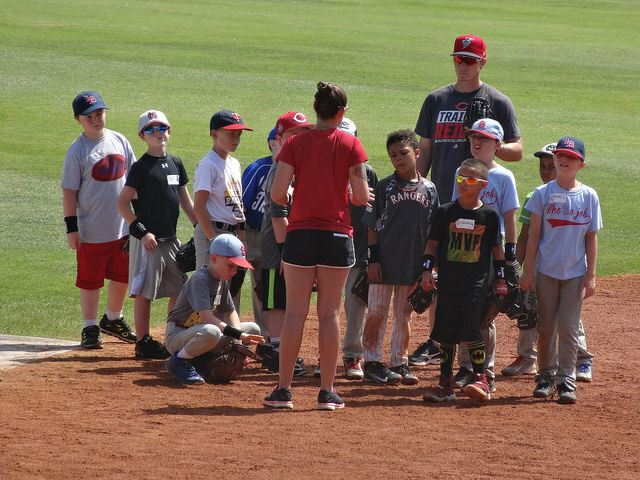 Members of the Division III Spalding University baseball team were also on hand to help teach the kids. After warm-ups, Brian’s group went to play a game of wiffle ball with some Golden Eagles to start things off. 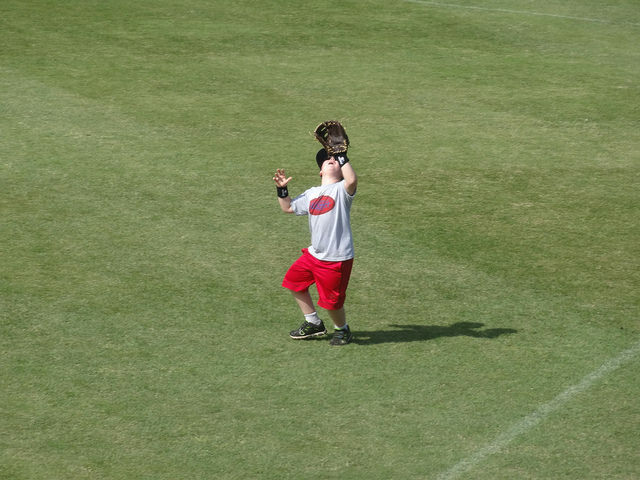 After the wiffle ball game, his next station was in the outfield catching fly balls. The players were hitting the baseballs much higher than the kids were used to seeing, but most did a good job of catching them, anyway. 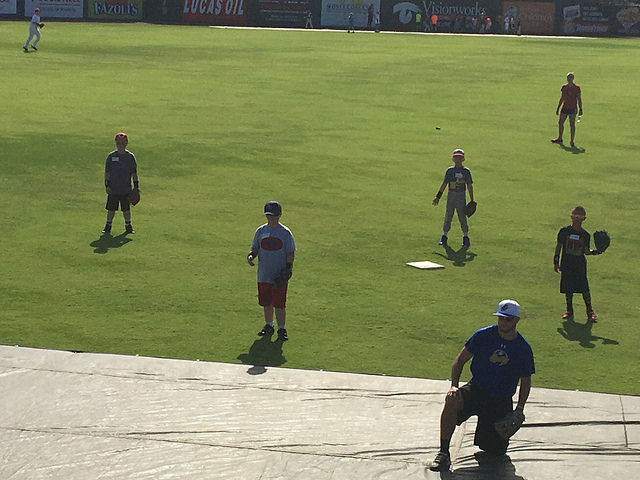 After working on the pop-fly’s, the groups worked on fielding the ball off of the wall. This is something the kids haven’t dealt with much at their age. They had some good drills, and made a game of it. After that, their next station was catching. One of the Bats coaches was running this one, and you could tell he was an old-school baseball guy. He didn’t put up with much from any of the kids (and Brian did have a few smart-asses in his group), and expected them to hustle and work hard. Nothing wrong with that. I didn’t get any good pics of the last two stations, so we’ll move onto base-running. 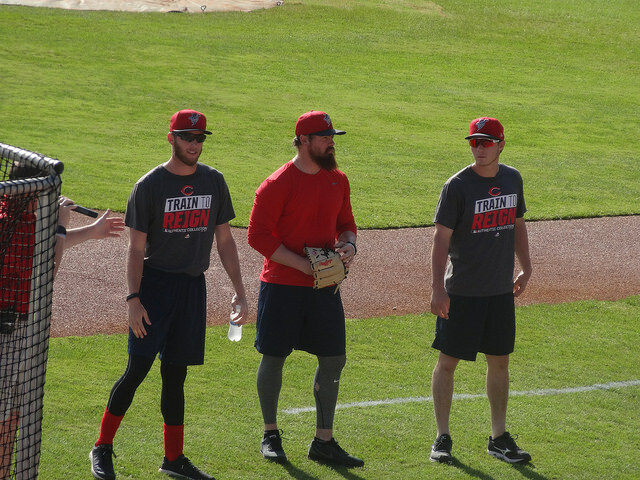 The boys worked on running through the base, and making that hard turn toward second. 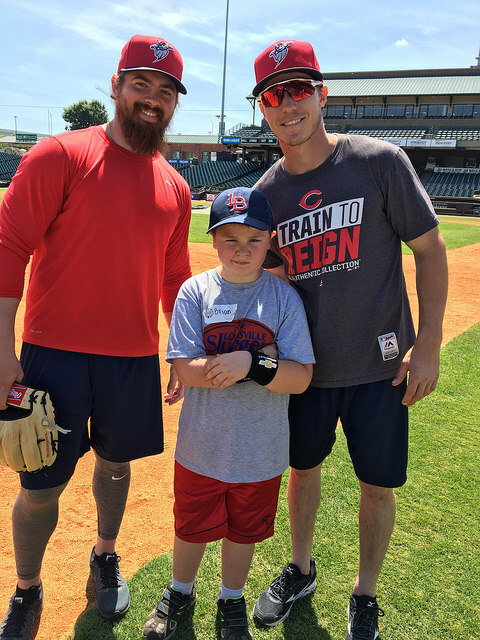 I wasn’t able to follow him down to the indoor batting cages, but he said he hit the ball pretty well. No surprise, as that’s probably the strongest aspect of his game. 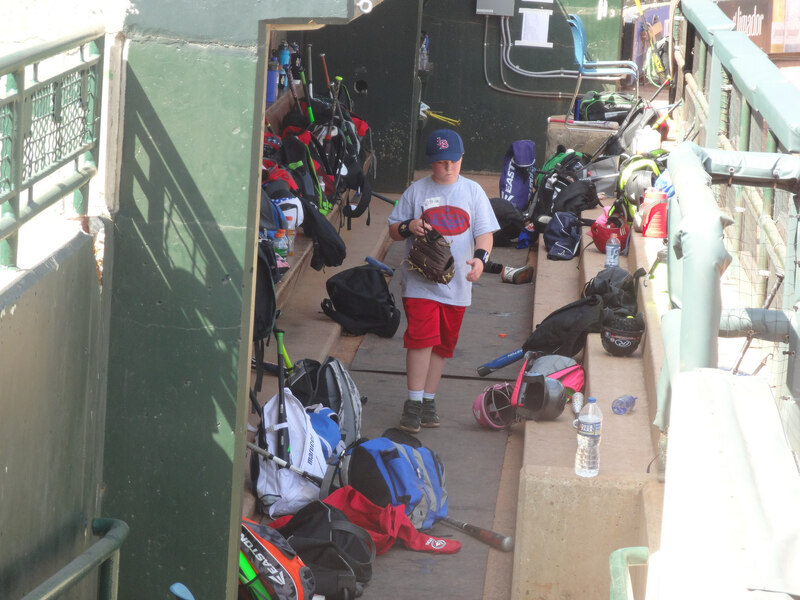 I did snap a shot of him in the dugout, though! 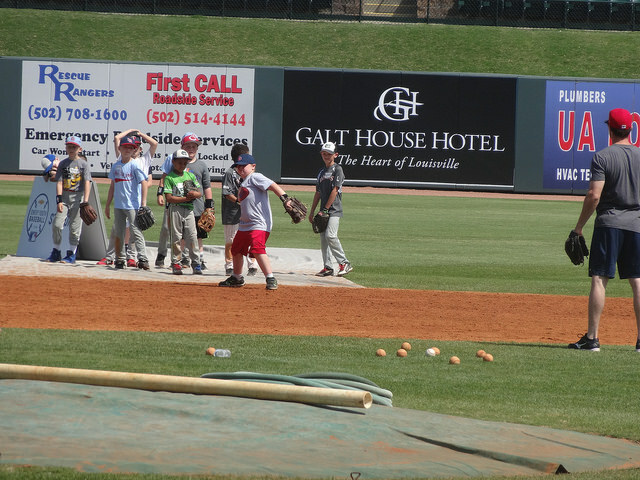 Then it was time to gather at the short-stop position for some ground balls. Brian has gotten a lot better at fielding over the last couple of seasons. I was having fun just seeing him out there on the field. They had a little problem with some bullying in their group, but the Bats official put a stop to that asap. Sometimes you get some kids from the same team in these groups, and think they can push kids around and run the show. The last station was pitching. 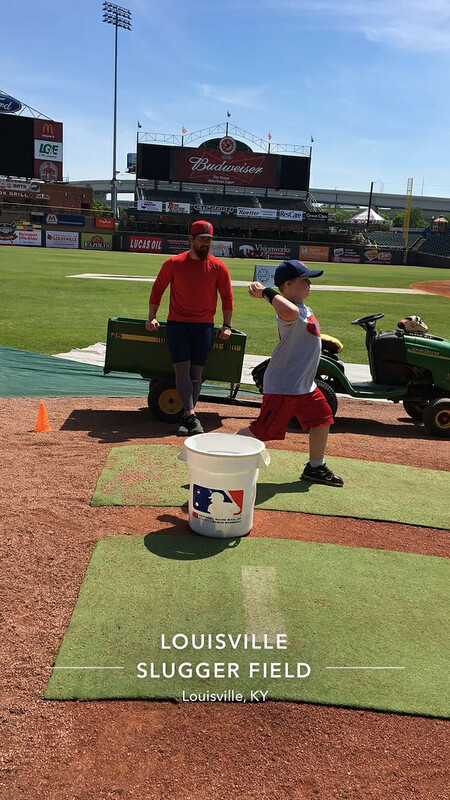 Brian will be entering the kid-pitch division for the first time this fall, so this was good instruction he was getting. 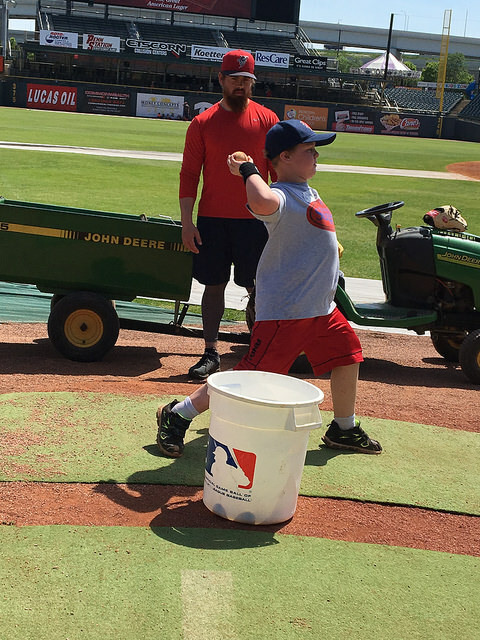 He needs some help with his throwing mechanics, any, so this station was good for him. In all, this was a fun experience for him. They move the kids around pretty quick, but I’m hoping he picked up a thing or two to get ready for fall ball.